dunnhumby, the world’s leading consumer data science company, has invited brand and marketing decision-makers and experts to the first presentation of its data-driven retail media offering, “Connect Media from dunnhumby”. The event was held in Prague, December the 12th. Through a new partnership between dunnhumby and Tesco that was announced on October, dunnhumby will manage Tesco’s point of sale, sampling and online media, in addition to Tesco Clubcard and mailings. Brands will benefit from the combination of this extended media portfolio with Connect Media’s unique ability to plan, execute, measure and analyse the impact of their campaign activity, on and offline, based on insights into the shopping behaviours of six million active Clubcard, Tesco loyalty program users across Central Europe. We create a win win win solution. The retailer wins by having relevant media for their customers, at the right time, the brands win by achieving their strategy and ultimately the customer wins as they have a richer and more focussed in store experience. Connect Media gives brands the opportunity to bridge the gap between above the line and below the line advertising, reaching customers with relevant messaging at home (through Clubcard mailings), on the go (via Tesco.com and SMS message) and in store (point of sale). This in turn leads to a richer in-store experience for customers, driving loyalty for retailers. It’s a business model has already been successful in other markets; in the last 4 years, dunnhumby has run 2,865 point-of-sale campaigns in Tesco UK stores. In the two years since launching Connect Media in Thailand, dunnhumby has delivered over 1,000 campaigns for 200+ brands and their agencies, generating 18.5bn exposures and gaining over 24 million new customers for these brands. The following case study presents a UK Nestlé integrated campaign that utilised Connect Media’s customer insight-led planning and media portfolio to identify and reach shoppers with relevant messaging across multiple touchpoints. Tesco’s Coffee category was experiencing overall growth. However, two of the largest areas within the category – Premium Instant Coffee and Regular Instant Coffee – were in decline, driven by a lapse in customers. dunnhumby worked with Nescafé, one of the largest branded suppliers within this category, to develop an integrated campaign that would engage Tesco shoppers and reverse the decline. If Nescafé could win back lapsed loyal customers and expand existing customers’ Instant Coffee repertoire, this would help to reverse the decline. Existing customers, i.e. loyal Tesco shoppers who are also loyal to coffee and Nescafe. The objective was to grow their coffee repertoire in order to increase spend. Lapsed customers, i.e. loyal Tesco shoppers who were previously loyal to coffee and Nescafe, but who had lapsed. The objective was to grow penetration by winning them back. 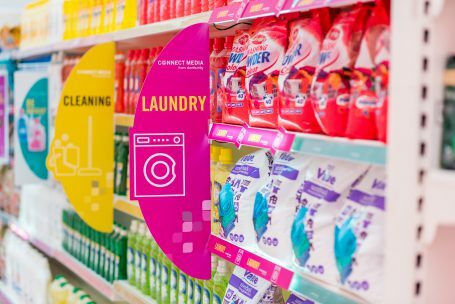 dunnhumby and Nestle developed an integrated campaign that made extensive use of the Connect Media toolkit, including mailings, sampling, in-store POS and Tesco.com advertising. A full gondola end was available in-store to display a variety of Nescafé products across the range, along with a strong promotional message of “3 for 2”. Loyal ‘VIP’ Nescafe coffee customers received a mailing focused on ‘coffee shop occasions’ that shoppers could enjoy at home, through the coffee range available in Tesco. This included a personalised coupon to redeem a free gift at their local large format store. VIP customers could collect their free sampling bag at 50 Tesco Extra stores. Any Tesco customer could sample a range of coffee at the stand. Visually impactful point of sale (POS) in the aisle to educate shoppers, highlighting the breadth of the Nescafe range. 12 weeks post-purchase, customers received Clubcard Bonus coupons at till to encourage repeat purchase. Stephen Russell, Managing Director of dunnhumby Central Europe, commented: “We link brands’ objectives to media packages that will drive the best results, based on customer insight – then we accurately measure the impact of activity, through tried and tested capabilities developed through our work with brands and retailers across the world. This provides valuable insight into campaign performance and enables managers to make decisions based on data, rather than gut feel”. Brands and agencies can work with Connect Media on booking campaigns due to run from 1st January 2018.